I have been digging old bottles for most of my life and I know what it takes to find spots to give us a better chance of getting into older glass. If you don't do the research to locate these bottle graveyards then you will not be reaping the rewards anytime soon. That being said I have been going through a bit of a slump myself in that particular area. With many good to great digs under my belt I have hit an all time low for not being able to find privies in backyards. I have many permissions but it seems the bad luck cloud has been hanging over us for a while now. The last place we attempted to dig was in East Pickleville pa. The town looked very promising. It was a nice little old village, established in the early 1800s and it looked like the bottles should be flowing from the outhouse holes like nobody's business. But that was not the case here because we could not locate one single outhouse! The ground was like solid rock everywhere, when I tried to stick the probe in I got a 3.2 aftershock from the vibration off the hollow handle! That was no fault of our own though, it was mother nature's curse to us, it was something we had to deal with when this type of situation presented itself. I started to wonder if there were even any privies in these yards? If we were having a hard time probing I am sure the people of the past had an even harder time digging these 10 foot plus holes through solid clay to make an outhouse pit for their daily use. Sometimes they would use the "clean out method" If a hole could not be dug in the yard, they would put buckets under the back of the outhouse where the seat hole or holes were located. Then the buckets of fun would be dumped out every other day. These types of outhouses would not produce any bottles or other types of trash. So what I am trying to say is "we despise clean outs" they are a privy digger's nightmare. I continued stabbing the ground and I hit nothing but hard slag and stone. Then all of a sudden the probe felt different, it went down, down, down, right to the handle. Could our luck be changing ? We were about to find out. The dig continued just like any other outhouse dig, the ash and fill was being piled top side. Then I tapped something, it didn?t feel like glass it felt more like some sort of plastic! We were kind of high up at the start of the pit so we were not jumping to any conclusions just yet. I would be worrying if we found plastic deeper in the hole. That would basically tell us the pit had been dug and filled in by another digger. So we still had hope. The object was starting to take shape now, it was a kind of an odd shape and it was yellow in color. Paul kept asking me what it was but I didn?t want to say just yet. I needed to uncover more to make sure I wasn?t seeing things. Finally it was in view good enough to identify. One more time Paul chimed in ,?What is it man?? I shot back reluctantly, ?It?s a freakin telephone, that?s what it is!? He looked at me like I was cuckoo. Then I pulled it out of the ground, it was a yellow rotary style desktop telephone with the cord intact! This certainly was an odd thing to come out of a privy, and we have found some really odd items in the past. The phone was tossed aside and we continued to dig. We worked at it for a while with no signs of glass or remnants of anything old to be seen. This also would be the case when we finally hit the bottom of this one. The only thing that we can say was found in this pit was a yellow Telephone! It must have been tossed in when they filled the sinking hole in around the 1970s. We knew there were other privies in this yard but since we had probed every square inch and hit hard stone everywhere, we were at a loss of where to try next. Paul was walking the yard searching for a spot when I had a idea to lighten up the depressing situation. I picked up the phone and spoke into the receiver ? Hello do you know where the privies are located in this yard?? Paul looked at me like I was nuts (once again) but he knew how I joked around all the time so he just shrugged it off and went right back to probing. 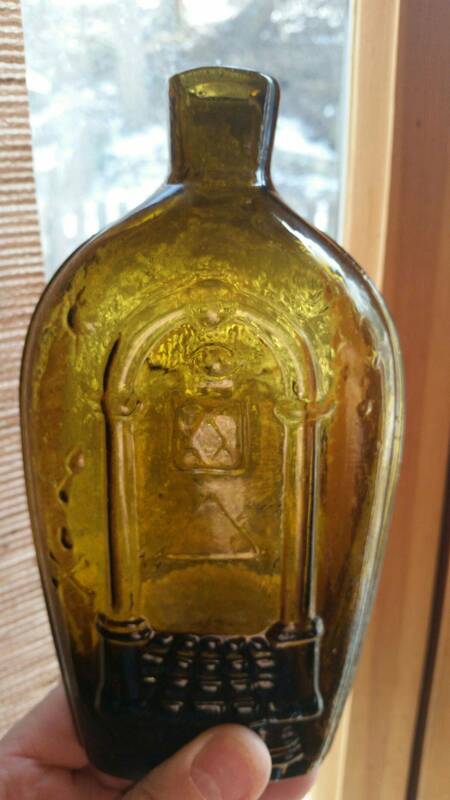 To make the prank look more insane I went to the truck to get an old amber 1870s whiskey bottle that was lying in the bed for a few months. I held the phone and ripped the cord out of the receiver then stuck the cut end in the top of the bottle. I held the receiver in my hand and made my way back to the yard, then I started my routine all over again. ?Hello can you please tell me where the outhouses are located in this yard?? Again Paul had that look. Just as I was about to defend my sanity I heard a strange thing. It sounded like a very low static scratchy sound, was it a bee or something stuck in this receiver? I heard it again - it was no bee. I was just about to thrown the gag phone in the bushes when I thought I heard a faint voice! I was in shock! I did kind of feel light headed from the heat and lack of food and water. So I thought that might be the cause of my delusions. I didn't want to tell Paul because he already thought I was koo koo so I just played it cool. I listened real hard to hear this voice again, when I finally made it out I could not believe what I was hearing. It was truly a voice, but from where, and how? I was on the other side of the yard standing in shock not able to move. I remember asking ? Hello do you know where the privies were located in this yard?? or something on those lines. I was seriously joking when I did this. The voice spoke these words in a creepy low monotone voice almost like an old scratchy horn phonograph. ? Hello good sir the outhouses in my yard were situated on the back alleyway by the old weeping tree, good day.? then it went back to static. I was numb with fear and excitement at the same time but I had to act on this. It would not be in my best interest to block this out. I knew I was not going crazy; I heard it! Paul was in the middle of the property in the hot sun. I was making my way back to the alley, it almost felt like I was floating, my legs were moving but my mind was frozen stiff. When I reached the alley way I told Paul to toss over the probe. I stuck it in the ground right where ?I was told? and Bam down it went! I jammed the rod under the alley next to the big weeping willow stump and the privy was right there! Right where the voice told me it was .My body felt like jello now; Paul had no clue about this weird event that was taking place. I was not sure I was going to tell him either. Maybe I wasn?t supposed to tell him? I had to keep it quiet for a while to protect my sanity anyway. Just for chits and giggles I probed 6 feet away from the first pit and once again the probe sank to the handle under the alley! We had 2 privies ready to open up. Paul didn?t really pay too much attention to my outhouse finding skills because we both have found privies this quick in rough yards in the past. It?s just a matter of ?luck? and perseverance with a little bit of skill tossed in for good measure. But this time it was different, real different! I didn?t know what to do about the whole thing. I figured I would have to shut it out of my mind if that was at all possible and concentrate on digging these 2 privies. After all that is what we were there for. I knew this was going to be the strangest privy dig I was ever involved in. I even had to take half a Xanax just to be able to function normally. My insides and my mind felt like a slinky going down the Great wall of China steps in slow motion . I started to think about all of the things that were involved here. First of all, this was something that only happened in the twilight zone. You remember the TV show right? Second the voice that I heard had to be someone or something that used this outhouse! and lived back in the 1800s. I wasn?t sure I wanted to believe all of this but how else could I explain it. I was going to have to let Paul in on it real soon because it was too much for my mind to handle alone. Maybe if I let the cat out of the bag I would feel better about the whole thing. It was now or never. I walked up behind him and started the weird conversation. ? Do you believe in spirits from the past ?? I knew I could expect an answer right away since he had told me of a strange event that happened to him in Gettysburg when he went on a family vacation. It was a long time ago and I forget what all actually happened to him, so I made him give me a refresher story. It went something like this. Paul and his family took a trip to Gettysburg Pa in the summer of 2010. They rented a bungalow very close to the battlefield. While everyone one was sleeping Paul went to the window and peered out to soak in a little history. It was a very dark moonless night, the only lights visible were those from other scattered bungalows in the area. He could not make out much but as he turned to go back to bed he heard an odd screeching noise and jerked his head back to look. What he saw was unexplainable. There in an open field he saw a figure of a fully dressed civil soldier floating across the battlefield slightly above ground level, at a pretty good clip. The figure was in the form of a mist with a dim grayish light coming from inside of him. The apparition seemed to be on a mission to get somewhere. When he made it to the wood line he was gone, like vapor disappearing into the air . That type of story is kind of hard to make up and besides Paul was not the type of guy to tell tall tales. So with that out of the way I made a decision to tell him everything that was going on with the phone. ?Hey Paul I have been getting phone calls from the past.? I figured I would get right to the point, instead of beating around the lilac bush. Obviously he thought I was joking. Because like I said, that is what I do on a regular basis. Why would this day be any different ? As I started to try and explain the madness as best I could the phone rang, the timing was perfect! Paul's jaw hit the dirt but he still thought I was trying to pull a fast one somehow, until I handed him the receiver. I didn?t hear what the man was saying but by the look on Paul's face I had a feeling the voice was telling him the same thing he told me when I first found it. Paul took the phone away from his ear and he looked like he was in another world and he pretty much was. He laid it on the ground. ?What the hell was that?? he mumbled in a low almost intoxicated sounding voice. I went through all of the details of what I experienced and we sat there looking at each other for a few minutes wondering what to do. When Paul began to believe 100% we decided to do some tests. I was not sure if we should call them or wait for them to contact us? Besides I didn?t know how to call them, there was no dial pad, just a receiver a cord and a bottle. I stuck the end of the cord in a bottle for the prank effect. I was unsure if that was needed to activate the phone from the past or not. What I did know is we were about to embark on a crazy adventure! When we finished up with the yard and got everything back to the original condition, we decided to go test the phone on a place where we could not find the privies, even with weeks of probing it was a no go. There are not to many times where we would abandon a yard without finding the pits but there were a few instances where we had no choice. These ?Ghost pits? as we call them are depressing to even think about. We take the time to get the hard earned permissions but we have to leave empty handed. Today we would go back to one of the non-productive yards and wait for the phone to ring. It even sounds weird casually talking about it, like it?s a normal everyday occurrence or something. It was a hot Saturday in August and we were ready to tackle a ?Ghost pit? yard. It was exciting knowing what happened at the last place, but the question was, would it work here? We were nervous as we strolled down the busted up Victorian slate sidewalk that led to an old weather beaten half-standing shed. I had the bottle with the phone in my backpack; I turned around and . I gave Paul the nod to do the deed. He picked up the receiver from the backpack like he was calling in an airstrike on a battlefield. It was kind of an airstrike of sorts, a tactical strike to locate some privies! It is funny how we called these elusive privies ?ghost pits? long before we found the strange phone. It was almost like it was meant to happen to us, like it was planned. You know how the old saying goes, ?things happen for reasons? but what in the world could be the reason for this inexplicable occurrence! We decided to leave the probes in the truck and let the phone do its magic. If this were to work on this yard then I was pretty sure we would be in business for future permissions. Heck we may never need a probe again! Paul got on the horn and waited. There was no sound or any type of static whatsoever . As he walked around the yard in a grid like pattern, still the phone stayed silent. Was this the end of our creepy little game? Then it happened! The scratchy static broke the silence, it sounded like an old ham radio trying to get a far off signal. But there was no voice to tell us where the pits were. This went on for a half an hour. This time a woman's voice rose over the static; she began to speak, ?The privy to my yard is located by the big rock; have a pleasant day gentlemen, ? and then it went back to scratchy noise and faded away. A lot of times the voice was very vague. Ok we got the directions but there were no big rocks in this yard? I did a walk around and did not see any rocks whatsoever, small or large. I decided to get a drink and think about this. Paul was walking by the back of the house looking for any signs of a big rock. This shouldn?t be hard to spot because the area was not that large, a typical row house yard . I took a seat on the grass and guzzled a big gulp of white cherry Gatorade. When I went to put my drink down, my hand landed on something hard and uneven. I removed some of the grass and dirt, I found the big rock! The rock had probably been buried over the years as this yard had been redone, most likely filled and refilled with topsoil. As I took more and more dirt from around the rock the size of it started to take shape. It was definitely a ?big rock? and probably the only one in the yard. I flagged Paul over and he agreed, it was definitely the spot. Now we just had to start digging around the boulder and verify there was an outhouse hole there . We still did not use the probes, we decided to use the phone exclusively. The homeowner came out and asked how things were going and if it was hard trying to find the outhouse in her yard. We looked at each other with sneaky grins and said, ?Oh it?s going great, it's almost like a little bird told us where to dig.? If she only knew. She offered us the use of her large patio table umbrella to put over the dig site since it was going to climb close to 100 degrees that day. I gratefully accepted her offer and set it up over the big rock. As the shovelling continued we were yet to get the vibe of any privy being there. Since we said we were not going to use the probes, we had to read the signs as we dug down. There was a 3 foot trench around the big rock, we were right on the verge of calling it quits. Then all of the sudden I hit a crumbly red clay brick with the shovel. Signs of old bricks are always a good indication of humans from the past being there. We concentrated on digging out the brick to tell us more about this mystery. It turned out that we were digging on the outside of a brick lined privy! The huge rock boulder was smack dab in the middle of the privy! Blocking the center off like a giant cork. While digging around it, we had no idea it was that big! Now another dilemma took centre stage. How the hell were we going to get this mammoth thing out? My first thought was my truck and a chain. I just hoped the chain I had was long enough to make it from the alley to the rock-corked privy. We have done things like this before. You have to get inventive when it comes to digging outhouses, it doesn't always go as smooth as you would like it to, a wrench is often tossed in just to make things interesting. The rock pulling operation was in full swing. Everything was working fine, Paul gave me the hand signals and I crept forward an inch at a time in my little S10 pickup. Before we knew it the mini mountain was sitting smack dab in the middle of the lady?s lawn. At times like this I start getting nervous about the home owner coming out, seeing the craziness that is going on in her lovely manicured back yard and then hearing the words, ?Oh my god that?s enough! Stop what you're doing!? But then reality kicks in. If she made us leave on the spot, who was going to remove the massive boulder and clean up the mess? We had her where we wanted her, on our side! She would just have to trust our skills as privy diggers. OK, the time had come to check out what was under the rock. As we walked back to the dig spot we were expecting to see ash and fill from the past, but what we saw shocked us silly! We were staring down an open 5 1/2 foot wide brick liner. It seemed to go down at least 10 feet, maybe more. My first thought was, ?We need a ladder to test the bottom of this thing, if that is the bottom we were seeing.? I had a 24 foot extension ladder at home but that would mean I would have to drive 25 minutes to get it. The neighbor must had overheard our dilemma and was kind enough to offer us his ladder. I love it when people are nice, it makes the world a better place, especially in the privy digging world . He was also very curious to see what was in this bottomless pit in his neighbor's yard. Sometime curiosity is a good thing. He probably has the same size hole in his yard. When this one is all filled in and the yard looks nice, we will lay on the charm and try to get into his time capsule. After a little small talk with the guy, we had the ladder in the pit and I was making my way down into the dark damp void. With each step I was praying for good things to happen. Bottles on the bottom would definitely be on top of the list. As I stepped off of the last rung I felt nothing but air! I was a bit freaked out from this I must admit. When the ladder was sent down we figured it was on the bottom because it stopped dead and felt solid. But that wasn?t the case. With the use of my pocket pen flashlight I saw what the problem was. The ladder was sitting on a ledge, a nice sized rock ledge. It seemed that they built the brick around a big rock coming out of the wall. Instead of trying to pull or break it out, the original diggers of the outhouse just left it there to save on the hassle of starting to dig another hole. We have encountered many privies with large rocks protruding from the sides and sometimes even the bottom. As I shined the thin beam of light downward I could not spot any sign of the ?true? bottom. It was turning into a dangerous situation. The ladder was hanging on by one rung, resting on the rock. I had to slowly and carefully climb to the top and extend the ladder, and pray it was a 24 foot hole because that is what size my ladder was. Right now we were at 12 feet. I made my way up and out of that hairy situation. A little shaken but ready to go on. We unhooked the rope and 2 hooks and let the ladder drop. ?Klank klank klank? it went down and stopped with a thud. ?That must be bottom?? if it wasn?t that would leave us with no other options but to abandon this crazy undertaking. It was time to flip a coin to see who would descend into this death trap. The coin was air bound. ?Heads? I called it, I lost. I seemed to get the shaft once again and it was only fitting. Deja vu all over again. This time I was going to get to the bottom of this. While I was going down I kept looking up and seeing the hole getting smaller and smaller. As I stepped off of the last rung I was finally on solid footing. I couldn?t see too much because my flashlight was going dead. I yelled up to Paul to drop down a ?scratcher? I made sure I was hugging the wall so I didn?t get knocked on the head, even though I was wearing a hard hat bad things could happen in deep pits. He let it loose, and a loud ?smash!? is the next sound I heard. I shined the beam towards the sound and saw a blue squat soda laying there smashed into 3 pieces! With a quick scan of the bottom, I saw something unbelievable, colored sodas everywhere! On top and half sticking out of the fill. These kind of things don?t happen every day in the bottle digging world. Hell they don?t happen in a lifetime. This dig turned into a long night shift operation. There were so many bottles, and the time was just flying by. We had to break out the headlamps and flashlights to pierce the darkness. I had an idea, I suggested we use an old whale oil lamp we found in another privy for light. I just happened to have a jug of modern lamp oil and an assortment of old lamp parts in my truck. I had them with me because I was going to sell some parts to a buddy of mine who collects antique lamps. It really felt like we were digging in the past with that old lamp burning at the bottom of the outhouse. With all of this digging going on we forgot about the ?phone? ; what were we going to do about this weird object? I had no intention of telling anyone else; they would think it was pure poppycock. Besides I wanted to keep using it as long as it still worked. As Paul was in the pit digging I decided to walk down the block and check out a few potential yards to do. Since there was hardly any dirt to haul up, I figured he would be down there a while running his fingers through the colored beers and sodas. It was 11 o'clock at night and I guessed there would be no one awake to get permission from, so I did a little ?window shopping?. I would check out the house and if it looked good I would knock the next day and try and get permission. I had so much caffeine in me I could look all night, but I couldn?t forget Paul back at the loaded open privy. It was almost becoming an obsession. As I wandered the streets and alleys in the cloak of darkness checking out the old homes on the block, I had a crazy thought. I even started to talk out loud, no one was around so what hell. ?That?s a perfect year house looks to be 1860-ish, I should check it out.? I acted on impulse and jumped over the low busted up split rail fence. It was now 12 midnight and the streets were completely dead. I figured no one would see me if I took a quick walk in the yard and ask the ?phone? where the privies were. I know it was trespassing, but I was not going to dig or disturb the property. I had to reassure myself I was not doing anything wrong, when I knew damn well I was! But the allure of that contraption from the past took over my better judgement. Before I knew it I was in the yard pacing up and down with the phone to my ear. If someone were to see me, they would call the Asylum rather than the cops. I heard very low static but no voice yet. I was getting a little nervous but I kept moving. My plan was to locate the pit tonight and then go back and knock on the door in the morning to try and gain permission. Just a few more steps with this silence and I would be ready to leave. But all of the sudden the phone spoke! ?The outhouse to this homestead is back by the?.? and it just cut out, no more static, just dead silence. In a split second I was bombarded with bright lights! Oh my god it was the cops! It was almost like the phone knew the police were there. How was I going to explain this one.? The tall officer spoke, ?Do you live here?? ? No,? I replied. ?Stay where you are, don?t move?. They started to make their way into the yard. All I could do was stand still and shake. I tried to think of something to say but I had nothing. Soon I was face to face with 2 cops in someone's back yard at 12 midnight. I knew it was coming, ? Sir what are you doing with that phone?? I knew I was sunk, so I decided to tell them the truth I had nothing to lose. ?I use it to find old outhouses?? They both looked at me like I had 4 heads. In the old saying it's usually 2 heads but this was so bizarre I am pretty sure they saw 4 heads. Next thing I knew I was in handcuffs being led down the back sidewalk around the corner to the front door. I knew I should have listened to my inner gut and stayed on the other side of that fence. One of the officers knocked on the door and we waited. A few minutes went by and no one answered, after all it was 12:30 at night and most ?normal? people were sleeping. Soon the door slowly swung open. ?Oh my god what happened?? There stood an old man with a Yankees cap and a red robe on. He stood there looking at us while rubbing his eyes. When he turned the porch light on he shouted out, ?Rick? what the hell are you doing here?? I could not believe my eyes! It turned out to be one of Paul's dad's old friends Johnny. I had no clue he lived in this town. What are the odds? ?Do you know this man?? Thank god he said yes. After all the talking and making sure everything was ok they took off the cuffs and started to leave. As they were walking out one of them blurted out ,? By the way what did you say the phone was for?? I just looked at them and said, ?What phone ?? Not another word came out of their mouths and they slowly drove off. I'm sure they would be telling some good stories back at the station. I had met Paul's dad?s buddy Johnny L a few months ago at a car show, thank god he remembered me. I went on to tell him that Paul was 3 houses down digging in an outhouse. The great thing was that Paul's dad told Johnny all about our crazy hobby a while ago so he believed every word I told him. Except for the phone, I didn?t tell him about that. There was enough going on, I didn?t want to open up that can of worms. I explained to him that I was looking for another place to dig for the next day, and he just nodded his head, gave me a hand signal and said goodnight. I caught him just before he got back in the house. ? Johnny would you mind if I check the yard before I head back to Paul?? He was fine with it. He gave me his blessing and mumbled, ?You guys are nuts,? then shut out the porch light. I decided to make my way back to my digging partner and see what he had piled up over there. I hoped it was a glass mountain of old colored bottles. The Monster caffeine drink was starting to wear off now and I was slowing down. When I arrived at the pit Paul was sprawled on the home owners fold out lawn chair. I guess he was losing steam also. Then I did a double take, he was actually cutting Z?s sleeping. I scanned the area around the privy and did not see any bottles so I figured I would wake Paul up and ask him how he made out. But just then my flashlight caught a blip from under the lawn chair he was on. With closer inspection, I was looking at least 60 colored squats and stone beers! I guess he cleaned out the bottom while I was getting arrested. I didn?t want to wake him since he had done all the work getting the bottles up and out of the deep pit himself, so quietly I gathered up the tools, spruced up the area and covered the hole with a sheet of plywood so he could take a longer cat nap. Thank god there was nothing to fill in, that doesn't happen to us very often. The homeowner mentioned something before about making a bomb shelter of some sort if we found a brick liner. He got his wish. This dig was history, my watch said 2 am and it was time to get our filthy bodies home and crawl into our beds. We would have to wait to use the ?Privy phone? again; it would be a week and a half before we would hear that wonderful creepy scratchy sound. We had Johnny's yard to do and I prayed that the good people from the past would not let us down. Time will tell.